Wherever the Singapore Slingers are hiding their proverbial switch, opposing teams have yet to find where it is. The Slingers once again turned the switch on during crunch time as they overcame a sluggish start and stunned the Westports Malaysia Dragons, 78-77, in a double-overtime thriller Sunday, January 8 at the OCBC Arena in Singapore. 'I'm pretty happy (with the win) because it is no secret: we just believed. 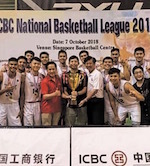 We, the coaches, just kept telling them be calm, be disciplined to get ourselves more positive and, of course, we needed to tell everybody to believe,' Slingers head coach Neo Beng Siang said. Wong Wei Long (187-G-88) and Leon Kwek came up big in the fourth and overtime periods while Alexander Xavier (198-G-88, college: S.Nazarene) scored the biggest basket of the game - a driving lay-up in the final five seconds of the second extension off a Dragons turnover to hand the Slingers their seventh win in the season and the Straits Cup title as well. 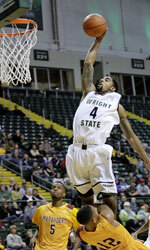 Alexander finished with a team-high 25 points to go along with 9 rebounds, 8 assists, and 5 steals. Howard Justin (208-C-81, college: Mercer) added an all-around effort as well, tallying 22 points (10-of-17 field goals), 10 rebounds, 4 steals, and 4 blocks. Wong had a rare double-double of 17 points and 14 rebounds. He scored 14 in the final quarter and overtime periods. The Dragons' unforgiving defense held the Slingers down to just 24 points in the middle two quarters and 28 percent shooting. On offense, Freddie Goldstein (178-PG-88, college: S.Alabama) once again initiated the defending champions' pick and roll game which forced the Slingers to switch. The Dragons got plenty of open looks from that strategy with Goldstein himself already having 10 first quarter points. 'We punished their switching finally. I give our guys credit for forcing them to re-change their game plan. We attacked that. We were getting open looks,' Dragons head coach Christopher Thomas said. 'I loved what our offense did tonight. I didn't think they could defend us. That's big for us given they're the best defensive team in the league. For us to get the shots we were getting and the spots where we got them, I am really happy with that.' With that combination of execution on offense and solid defense from the Dragons, it looked like the Slingers were on their way to falling but again, they found a way out of the hole they dug. Still down by 5 points after Goldstein converted on back-to-back drives to the hoop, Wong delivered 5 straight points of his own, hitting a triple and a lay-up to tie the game at 59 apiece late in the fourth quarter. The Dragons had two chances to end the game in regulation, Marcus Melvin (206-F-82, college: N.Carolina St.) air-balled a three-point try under the final minute and Goldstein also came up short on his buzzer-beater attempt. In the first overtime, Wong scored five more points including an and-one conversion while Kwek hit a mid-range jumper which made it 68-62 for the Slingers. But Goldstein and Chee Kheun Ma (180-G-90) answered two straight triples to send the game to another extension. The Dragons then took a 77-72 lead although bad decisions allowed the home team to steal the game. Alexander hit a tough shot before Wong nailed two free throws which cut the deficit down to 77-76. A turnover by Spencer with just less than 20 seconds left paved the way for Alexander's go-ahead bucket. 'We just tried to read what their offense was trying to do. It took us some time. But I thought we executed well in the fourth quarter. That eventually got us back in the game,' Wong said. The final exchange summed up the difference in the game as the Slingers scored 22 points off the Dragons' 19 turnovers. The Slingers committed only nine turnovers and surrendered just six points off their miscues. They also had a 15-4 gap in fast break points and an 18-8 advantage in second chance points. 'We carried ourselves pretty well,' Beng Siang said. 'I think we executed well on both the defensive and offensive end,' Wong added. Goldstein topscored for the now 1-3 Dragons as he notched a season-high 30 points on 14-of-28 shooting. He added 6 rebounds and 7 assists although he also turned the ball over five times. Melvin added 21 points (5-of-11 3-PT FG) and 12 rebounds while Spencer had 18 points (7-of-9 FG) and 17 boards. Both teams will be on the road for their next assignments on Friday, January 13. The Slingers will face Alab Pilipinas in Binan, Laguna while the Dragons will meet the Hong Kong Eastern Long Lions in Wan Chai.